Labeled with the letter “B,” the site is located 16 nautical miles east of Key West, only 200 feet from the American Shoal Lighthouse. 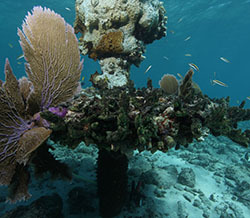 American Shoal is a large area of shallow water and coral reefs, a dangerous point for mariners navigating into Key West harbor. 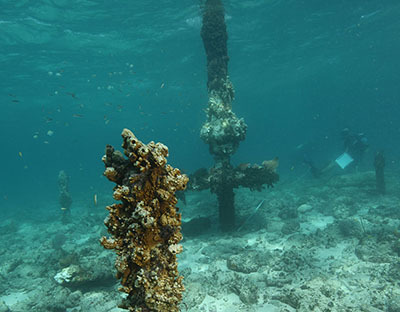 The remains of a tri-vane beacon were found at American Shoal. 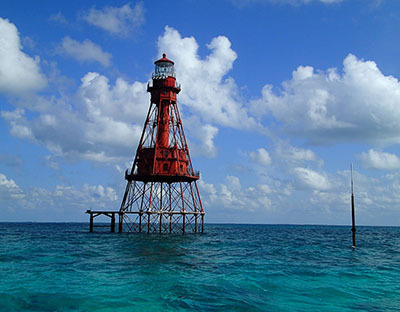 No evidence was found of an 1850s era beacon. 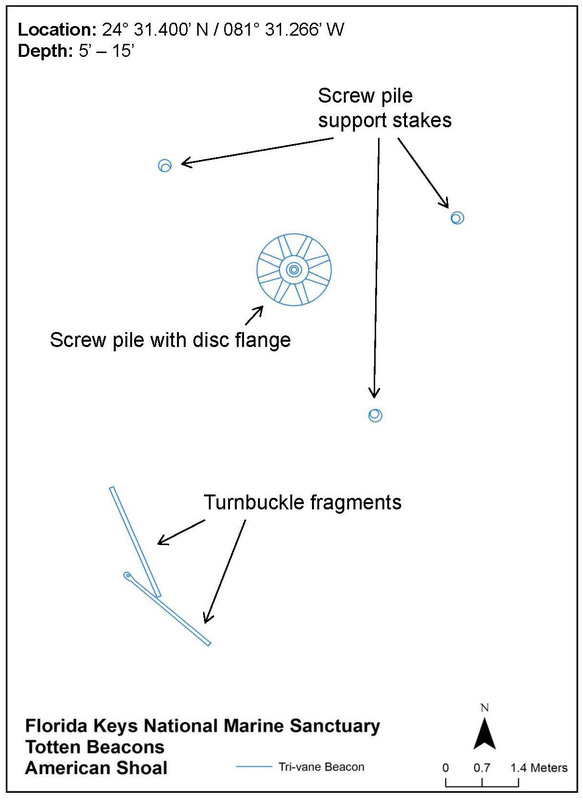 The disc base screw pile still stands upright, flanked by its three stakes. 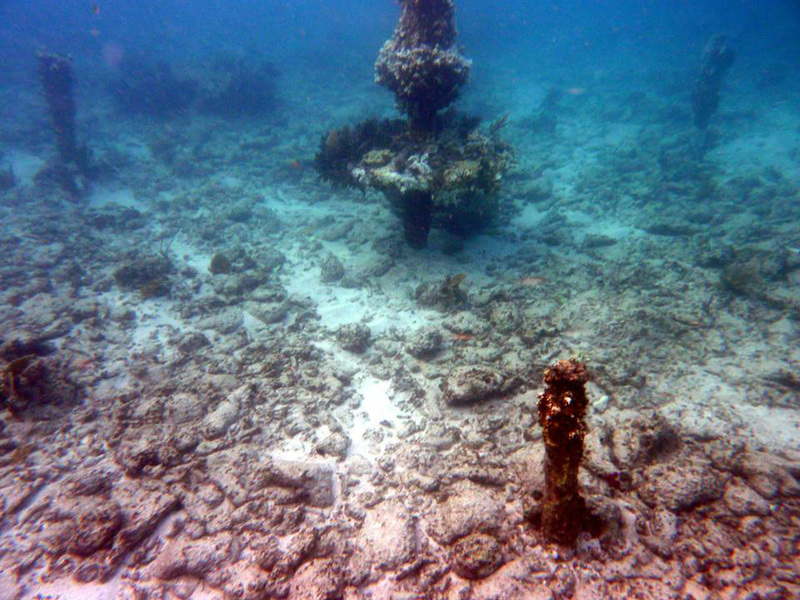 Pieces of its turnbuckle and tie rod supports have fallen to the seafloor nearby. The beacon’s mast rises nine feet from the seafloor to the water’s surface and then another twenty feet to the top of its spindle. 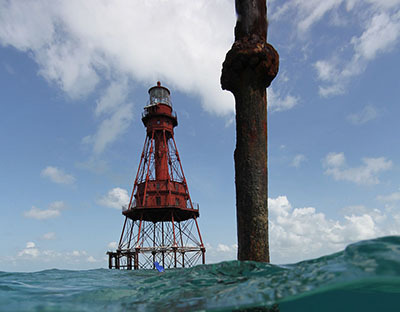 The “B” beacon is the most intact beacon structure still standing in Florida Keys National Marine Sanctuary. Click for a printable American Shoal site map. The substrate was rocky and all beacon remains were found at approximately 5 to 15 feet deep with significant exposure to tide and surge. 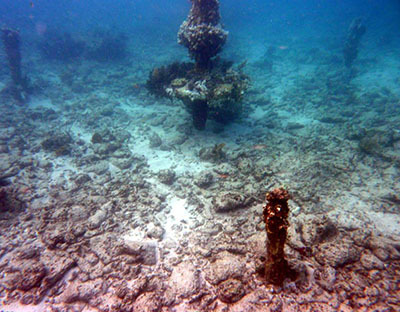 Site substrate could be considered barren or sparse in regard to sessile benthic organisms. 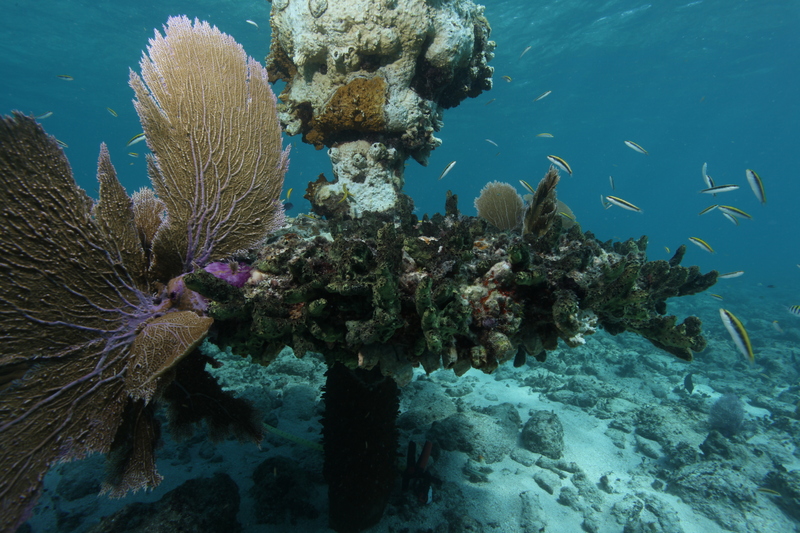 At the time of the survey, there was lesser starlet coral, knobby brain coral, mustard hill coral, and gorgonians documented within a 2- meter radius of the structural remains of the beacon features. There were 13 species of fish and four species of invertebrates recorded at the time of the survey. Click on image for credit and larger view. 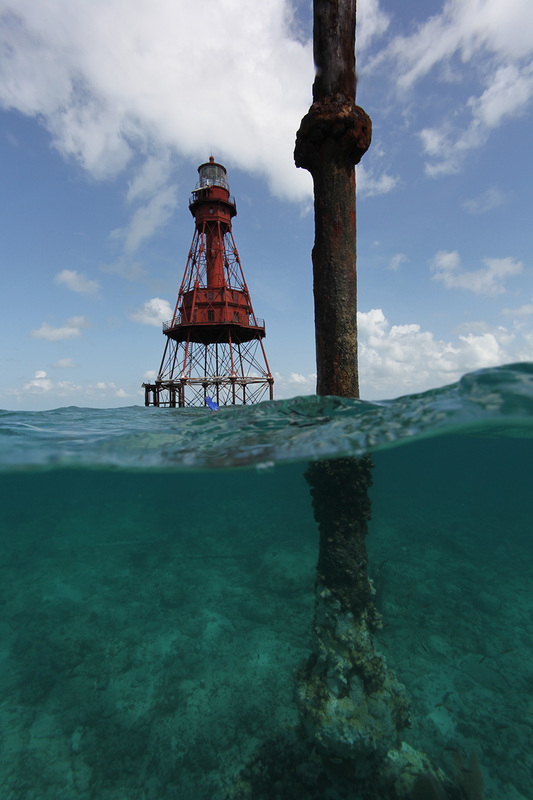 Explore the beacon remains on the seafloor without getting wet! The images below show part of 3D models created using multi-image photogrammetry. Click an image to load the model, and then click, hold, and adjust your mouse to view the model from different angles. The staff of Totten Beacon “B” at American Shoal was supported and stabilized by three outlying points. The staff was joined to these points by sets of tie-rods, which were tightened by turnbuckles. 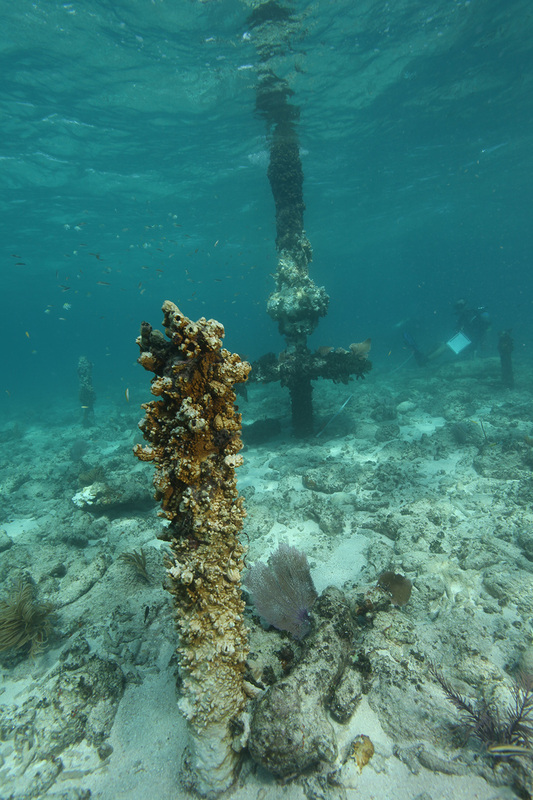 These tie-rods have fallen, but some are still found on the seafloor around the beacon. This tie-rod and turnbuckle assembly still retains the “U” shaped connector that secured it to a supporting stake.